Offering a delightful mix of fresh vegetables and fruits, local honey, molasses, maple syrup, homemade jams, jellies, and locally grown popcorn packaged for home popping and ready to eat in an assortment of flavors. Nestled in the heart of downtown West Jefferson convenient to local dining and shopping, this market brings together everything great about Ashe County. Ashe County Farmers Market features fresh seasonal produce grown locally, complemented by juried crafts handmade by Ashe County artisans. 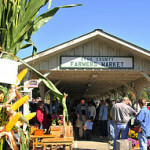 The market offers a delightful mix of fresh vegetables and fruits, local honey, molasses, maple syrup, homemade jams, jellies, and locally grown popcorn packaged for home popping and ready to eat in an assortment of flavors. Eating more greens? An assortment of pre-washed, organic and responsibly grown spinach, collards, arugula, multiple varieties of kale and lettuce and everything in between. Ashe County greenhouse growers extend the season with offerings all summer long and into the fall and are on site to answer questions about growing practices, storage and preparation. Specialty produce will satisfy the gourmet in you and fill your plates with color! The market has organic and non-organic garlics, goat cheeses, pimento peppers, shiitake mushrooms and all the colors of the rainbow represented with multi-colored beets, carrots, cauliflower and potatoes. And in the fall, shop the wide variety of pumpkins and gourds! Shop weekly for seasonal fruit that includes many varieties of fresh peaches and apples from the Brushy Mountains, local heirloom apples, cherries, grapes, blueberries and blackberries. Buy them fresh for eating now and for freezing for the winter months. Who can resist freshly baked home made bread? Fresh baked offerings include Amish breads, sourdough bread, an assortment of pies and gourmet cakes. Black walnut banana bread, cinnamon bread and sugar-free fried pies are market favorites! Local grits and other grains are also available.